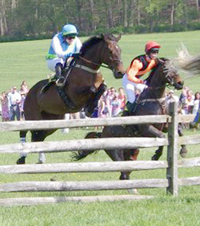 In April of 2010, Baltimorean Justin Batoff got a leg-up onto Prospectors Strike in the paddock of the Maryland Hunt Cup, one of the hardest, most grueling timber courses in the world. This would be Justin’s first attempt at the famed course, and he was nervous, but not as nervous as you would expect for someone who had only been riding for three years. That first Hunt Cup experience did not go as he had hoped, as Justin ended up falling at the 12th fence when Prospectors Strike stopped. But the stop in the race did not put a stop to Justin’s determination to ride again in the Hunt Cup. “He’s fearless,” said Prospectors Strike trainer Jack Fisher. Fearless is a word that was also often used to describe another Hunt Cup rider who took to the irons later in life. Like Justin, attorney, businessman and foxhunter Kingdon Gould, Jr. starting timber racing as an adult with the goal to ride in the Hunt Cup. And that he did on several occasions with his little brown horse Hurdy Gurdy, challenging some of the country’s top timber horses of all time, such as Mountain Dew and Jay Trump. While winning some and losing others, Gould and Hurdy Gurdy represented the roots of steeplechasing: amateur riders racing their foxhunters just to see who had the fastest horse. Today the Maryland Steeplechase Association recognizes foxhunters/amateur race riders and their horses who exhibit the same kind of game spirit with the Hurdy Gurdy Perpetual Trophy, donated by the Gould Family, the Howard County-Iron Bridge Hounds and The Equiery. Although Justin grew up in the Baltimore area and attended the Hunt Cup as a spectator with family and friends on several occasions, it wasn’t until he actually sat in the saddle as a 22-year-old that the idea of riding in a race began to surface. “What motivated me to ride was wanting to race in the Hunt Cup. Maryland timber is why I’m in this sport,” said the now 28-year-old. Justin’s brother Jeremy recalls that their first Hunt Cup experience was going to watch their mother’s friend Gerry Brewster ride in the race. “I think that was sometime in the early ‘90s. To bring it full circle, in last year’s Hunt Cup, Gerry and I had horses competing against each other!” Jeremy, who owns Prospectors Strike, reminisced. When he started riding, Justin was a senior at John Hopkins University majoring in art history. He played lacrosse for Hopkins as a freshman and swam with the likes of Olympian Michael Phelps at the North Baltimore Aquatic Club. Before college, he attended the Gilman School and after Hopkins, Justin remained in the area “because of my love of riding,” earning his law degree from the University of Baltimore Law School. Now working at the Baltimore-based Batoff Associates, Justin finds time to ride in the mornings with Jack Fisher or William Dowling. But what inspired Justin, who had never ridden growing up, to suddenly dream of riding in the Hunt Cup? Believe it or not, it had to do with his minor in museum studies. While working on a paper about pets in the 19th century, Justin was researching how hunting hounds differed from the domesticated pet hound and stumbled upon the story of Mountain and Muse, who arrived in Baltimore in 1814, toward the end of the War of 1812, and are considered the foundation hounds for all American hounds in general. The Mountain and Muse bloodlines can be directly traced today to hounds in the kennels of Green Spring Valley, Howard County-Iron Bridge and other packs. Part of Justin’s research included a tour of Stiles Colwill’s sporting art collection. “Between the art, the history and the stories, I was hooked,” he stated. Around this same time, Justin met Michael Finney, owner of the sporting-themed art and book store Yoicks. “I stumbled into the store one day out of pure curiosity and ended up hanging out all that afternoon, and from then on most days after class. He shared with me his experiences as a professional whipper-in, amateur jockey and all-around horseman,” Justin said. Finney eventually invited Justin out to ride some of his timber horses and encouraged Justin to pursue race riding. “He’s the one who told me I could ride races if I was willing to learn and wear out enough saddle pads,” Justin added. Through Finney, Justin quickly moved from foxhunting to steeplechasing and bought his first horse from Finney. Fire Foot had run once over timber but did not have that much experience when Justin cross-entered the horse in the Owner Rider Timber and Open Flat at the 2008 Casanova Hunt Point-to-Point. “I went off course early in that first timber race and just pulled up. I had no idea that I could have kept going,” he said, adding that because he really did not get very far, the race stewards allowed him to run in the Open Flat the same day. “I really only got to ride him in two races before switching to Striker,” Justin explained. Fire Foot was sold to Liz McKnight and is now a field hunter. Justin was introduced to Prospectors Strike (a.k.a. “Striker”) also through Finney, who took Justin out hunting on Striker with the Elkridge-Harford Hounds. Justin whipped-in a few times with Finney and then bought into the horse’s syndicate. Finney had first raced the 1999 dark bay gelding by Smart Strike out of Zuri (by Danzig) in a flat race at the 2007 Howard Country-Iron Bridge Races, which the horse won with Desmond Fogarty on board. Striker finished second over timber three more times that year with Rachel Lively as his trainer. “Rachel is the one that first found this horse and put all the early mileage on him,” Finney explained. 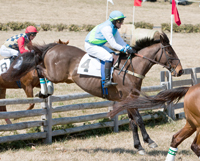 Justin took over the ride as jockey for the 2008 Elkridge-Harford Hunt Point-to-Point when Finney was out of a jockey. “It was just one of those situations where I needed a rider and Justin had been out exercising for me so we put him up on Striker,” Finney stated. “It was kind of crazy because he refused an early fence and I remember Tom Voss and Jack Fisher were sitting in a gator right at that fence yelling at me to keep going,” Justin remarked. What is even crazier was that Justin then moved the horse to the front of the field. “I really didn’t know what to do next so I just kept kicking him till we were out in front. The horse had just stopped, I shouldn’t have taken him to the lead.” But it worked, as the pair won the Limited Amateur Rider Timber. That first race was one of those moments when Finney and Fisher knew Justin was in this sport for the long haul. “That horse flat out refused and that kid just stuck with him and got him through it. You should watch the race videos and listen to the audio! It’s great!,” Finney added with a laugh. Next up was a win in the Foxhunter Timber at My Lady’s Manor. “That wasn’t pretty at all. I was just trying to hang on and stay on… but we won,” Justin said smiling. The following year, Justin moved Striker to Fisher’s Kingfisher Farm in Monkton and began galloping horses for Fisher in addition to working with Striker. Justin and Jeremy have been trying to get more and more fresh faces into steeplechasing through functions such as Rally on the Rail. Racing has become so much more than just actual riding for Justin and Jeremy and the two have been actively trying to get more new faces into the sport. According to Justin,“We really want people to know that anyone can be a part of this sport in some way. You don’t have to have grown up in the country to participate. 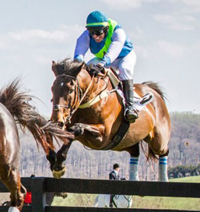 This area is full of great knowledgeable people who are more than willing to share their experiences.” From tailgating to ownership to actually race riding, the Batoff brothers have been spreading the word that steeplechase racing in Maryland is simply a fun sport to be involved with. 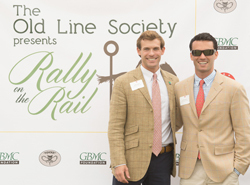 Justin and Jeremy recently organized the Rally on the Rail through the nonprofit philanthropic organization Old Line Society, where they are both committee members. The group aims to get a new generation of young Baltimore professionals to raise money for local charities and the arts through various social activities. Rally on the Rail took place at the 2013 Legacy Chase at Shawan Downs, allowing guests to enjoy catered railside seats for the day’s races and meet jockeys, trainers and owners. All proceeds from the event were donated to GBMC pediatrics and the day was very well attended. The Batoff brothers’ involvement with Maryland steeplechase racing continues to grow as they recently bought Oakdene, a farm in the Green Spring Valley where they plan to keep a few horses to hunt and where friends can come out and ride. 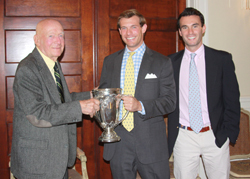 Fittingly for the Batoff brothers’ aspirations, Oakdene has a connection with the early runnings of the Maryland Hunt Cup; Hunt Cup programs from the early 1900s often list Oakdene as the start or the finish or one of the points. “Oakdene is a great old property and seemed like a perfect fit for us. It’s a place where Justin can ride in the morning and then easily get downtown to the office. It will also be a nice joint venture for us,” Jeremy added. The brothers are splitting the work with Justin overseeing the barn and farm aspects and Jeremy updating the main house. They are thinking of renaming the farm Summerfield Stables, as Oakdene was formally known in the early 1800s, and race under that name. Although Justin and Striker’s first two attempts at the Hunt Cup were unsuccessful, Justin persevered and in 2012, finished the race in sixth place out of 12 starters. “Its pretty amazing, actually, because I even lost my stirrup at one point and had a hard time getting it back,” he remarked. “It is pretty nervewracking to watch anyone race in the Hunt Cup, especially now that I have a better idea of what is actually going on. That being said, it’s also an incredible thing to watch Justin ride in the Hunt Cup, and ride well, knowing that he only started riding a few years ago,” Jeremy stated. Both bothers commented that getting their parents to come out and watch has been a challenge. They watch the race videos with Justin afterwards. Last year, Justin and Jeremy aimed Striker at yet another Hunt Cup. Justin and Striker started out the season on the second place team at the Foxhall Farm Cup Team Chase and then won the Open Timber at Green Spring Valley Point-to-Point. They also finished second in the Amateur Highweight Timber at My Lady’s Manor. Things seemed to be going quite well for the pair with Striker jumping well near the front of the pack. Then Striker threatened to stop at the second to last jump, tossing Justin over his head and spilling him to the far side of the fence. Striker then proceeded to jump the fence, landing on Justin. “I had to have reconstructive surgery on my face after that run,” he said. Of course, he waited until after that evening’s Hunt Ball to visit a surgeon. At the end of the 2013 season, the Batoff brothers decided to retire the 14-year-old Striker. “He owes us nothing. He is a tough horse to ride but the best horse I could ever have had to learn with,” Justin said. Knowing that Striker was nearing retirement, Justin and Jeremy started looking for other horses to race in the upcoming seasons. For 2014, Justin and Jeremy have two horses in training over timber with Dowling and one hurdle horse with Fisher. “Major Malibu is an experienced older timber horse we got through Jack. General’s Prize is a phenomenal jumper that Justin will use as a practice horse and ride around in some low-key point-to-points,” explained Dowling. “I’m really kind of excited to be riding in some of the smaller races again. It will give me a sort of fresh start,” Justin said. Interestingly, Major Malibu also got his start with Finney. After winning at Saratoga, the then four-year-old Malibu Moon gelding was sold to Mrs. Henry Stern and moved to Fisher’s barn.